Just in from LACo OLS, Scott DeBoer. That's right, Folks! You heard it here first. If you finish this race there will be D O N U T S at the finish line! 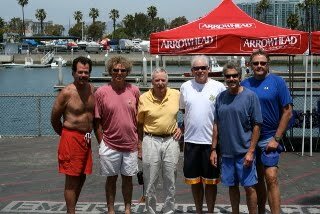 "The Fourth Annual Ocean Lifeguard "Tour De Central" Run-Swim-Run"
Wednesday, June 16, 2010 at 0630 hrs! Sign-ups begin at 5:45 a.m.
RACE begins at 6:30 a.m.
"No entry fee, no awards, just a race between fellow ocean lifeguards, the elements, and, of course, your pride." Course Overview Photo #1, below, shows entire course from Driftwood to Will Rogers Tower #5. Course Overview Photo #2, below, zooms in on Course from Venice Breakwater to Finish Line at Will Rogers Tower #5. *** There will be Gatorade, water, DONUTS, bananas and oranges provided at the Finish. Finish Line Photo, below. (View from above on bluffs). Will Rogers Tower #5. The race begins at Driftwood on the Marina Peninsula south of the Venice Pier so the first view you will have is of the pier as you begin the race running... Hopefully, there will be some surf like shown in this photo below by Nathalie Brouwer from July 2009. After returning to the beach after swimming around the Venice Pier you will be running toward the Venice HQ Garage and Division HQ!... so look your best! Above, is the view from SMS Tower #27 looking north toward Santa Monica Pier. You might be about half way at this point. Below, is a shot of SMS Tower #26, which you will pass on your way to toward the Santa Monica Pier. Above, a sample t-shirt that you will NOT be getting! Below, however, is a sample DONUT you could score for entering and finishing this race! Below, you will next pass SMS Tower #18, with its roofline proclaiming "Laird Plastics & Recyling". If you are still coherent you should see SMS Tower #16 next and the Santa Monica Pier! Finally, you are getting close to the Finish. Below you will recognize Will Rogers Tower #18. You've only to run to WRHQ, swim around the WRHQ Buoy and then run up to Will Rogers Tower #5! Once you see Will Rogers HQ you will be closing in on the Finish and your donut! Heads up! Be careful because the first storm drain you come across is Will Rogers Tower #8, in the photo below, and is NOT the Finish Line... but you can see it from there. You are almost done! Below, another view of the Finish at Will Rogers Tower #5, center of frame at storm drain and just before the Bel Air Bay Club. 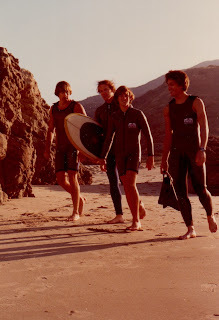 "A Blast From The Past: Blue Water Wetsuits, 1977"
"County Recurrent" is stoked to present three (3) classic old school photos from Blue Water Wetsuits, circa 1977, which our Northern Section correspondent, Steve Hotchkiss, sent along today. All photos courtesy of Steve. Many Thanks to Steve for sharing these great photos with all of us! Steve Hotchkiss and Frank Brooks posing for the Blue Water Wetsuit catalogue. Do you know who the other two guys are? Jeff Stern owned the company and I got a free wetsuit out of the deal. I don't know what the others got. I need to get this to Frank Brooks. Okay to post if you want. 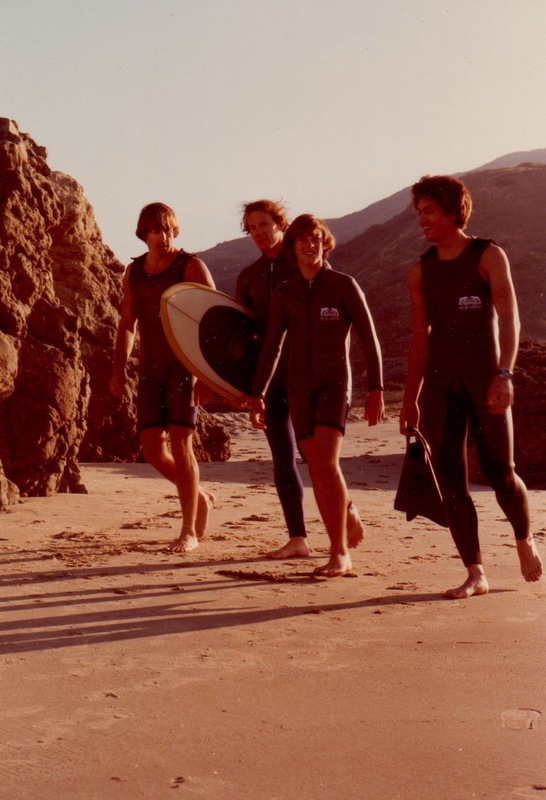 Can you name the LACo lifeguards that are featured in these photos? 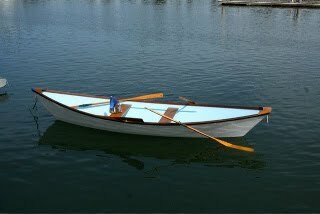 "Heads Up": New Home Needed For Recently Restored "Pete Peterson Dory"
"Heads Up, Dory men and Dory women!" 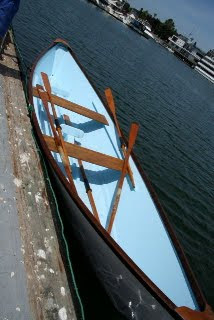 (Above, the Restored Peterson Dory. All Photos by "JT", aka, John Thomas. 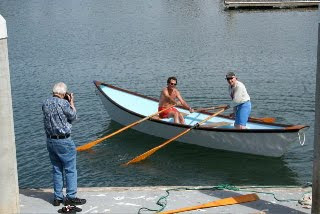 A Pete Peterson, all wood, non-self bailer Dory, recently restored by vintage Dory men, Randy Steigley, Tom Snyder and Harold Dunnigan and most ably assisted by the generosity of Scott Hubbell is looking for a suitable site at which to have it displayed. 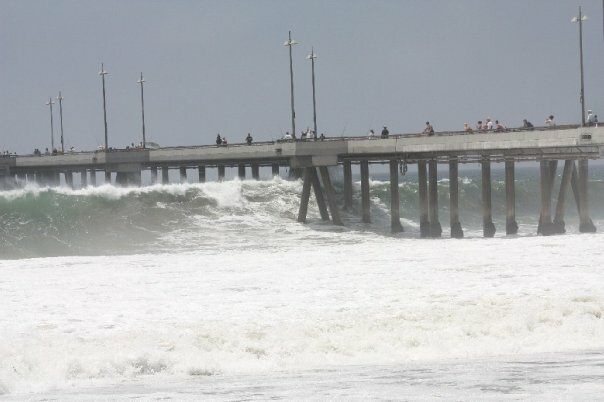 At present it is sequestered, in safe storage, on the Santa Monica Pier. Hopes had been that the City would create a museum at the Pier's end but funding just was not to be had... so, we need a place that is safe, secure and available for public viewing and we're looking for help. A brief sketch of Pete Peterson tells of his all-round Ocean Aquatic Skills, you name it, he could do it. 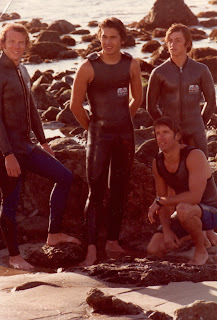 A Santa Monica Lifeguard Lieutenant, movie stunt man, diver, skilled Dory man. Maker of Dorys, in the days of wood/plywood, and paddleboards, one of which is presently being restored.... plus, the original designer of the Lifeguard Rescue Tube, from its original black inflated model to the current sponge rubber configuration... 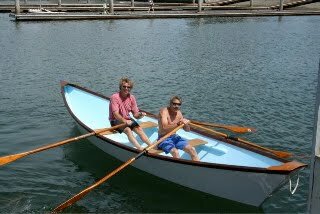 So the likes of those mentioned above are in pursuit of a site, hopefully in the Santa Monica, South Bay area that will preserve the memory of this talented Waterman of the past. Please contact me at 310 396 0839.